What You Need to Know Before Using Otezla? What Are the Possible Side Effects of Otezla? Otezla is an oral medication which is also known as apremilast, its generic name. This medication is used for treating adult active psoriatic arthritis ever since it was approved by the U.S. Food and Drug Administration (FDA) in March 2014. 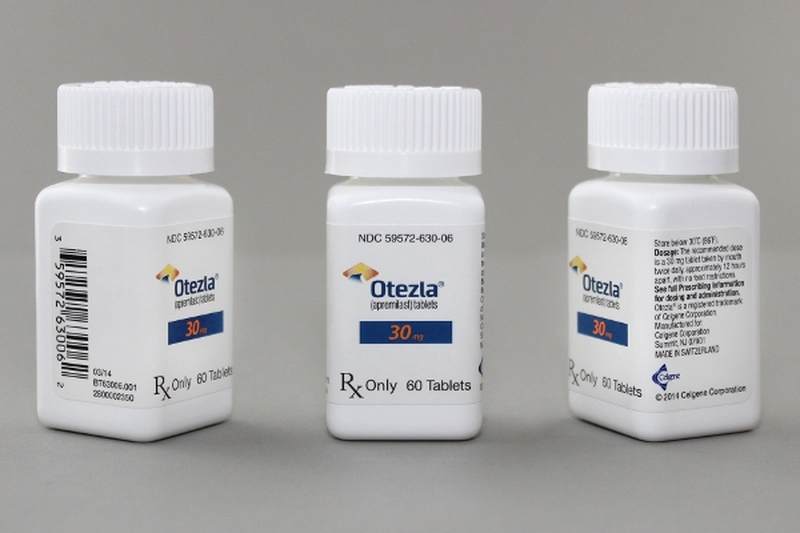 Otezla is a prescription-only medication that is available in tablets with strengths of 10-, 20- and 30-mg. The active ingredient in each tablet of this drug is apremilast while the inactive ingredients included are iron oxide black (30 mg only), iron oxide yellow (20 and 30 mg only), iron oxide red, talc, polyethylene glycol, titanium oxide, polyvinyl alcohol, magnesium stearate, croscarmellose sodium, microcrystalline cellulose and lactose monohydrate. Regulation of inflammation in immune cells is the treatment method of Otezla for treating psoriatic arthritis and psoriasis. Most of the inflammatory action taking place in a cell is controlled by an enzyme by the name of PDE4 or phosphodiesterase 4. By inhibiting this enzyme, Otezla lowers the inflammation level associated with psoriasis. Otezla lowers swelling and tenderness in joints of patients suffering from psoriatic arthritis and scaliness and redness of plaque psoriasis by helping the body controlling inflammation. If you have an allergy to the ingredients present in Otezla or to apremilast, you must not use this drug. The effectiveness of Otezla might be lessened with the use of some medications and it must not be used in combination with them. Therefore, it is important to inform your doctor about all the prescription and over-the-counter medicines you are taking. People aged less than 18 should use Otezla with care because the effectiveness and safety of Otezla in them have not been established. Moreover, patients with a serious renal impairment must take reduced or modified doses of this medication. There are no studies performed on the effect of Otezla in pregnant or breastfeeding women. Thus, you must inform your doctor about your pregnancy or plans of breastfeeding before taking this medicine. Even though side effects of medicines are not experienced by everyone, most medications have some adverse effects. Some patient reviews and clinical trials have found the following Otezla side effects. Headache, tension headache, upper respiratory tract infection, nausea and diarrhea were some of the side effects of Otezla found in psoriasis clinical trials. Headache, nausea and diarrhea are the commonly reported Otezla side effects in treating psoriatic arthritis. Loss of bodyweight is an adverse effect of this drug in some patients. Doctors must keep an eye on weight of the patients. The doctor must decide whether to continue or stop Otezla if you lose body weight suddenly. Deterioration in depression is one of Otezla side effects. Some patients in clinical trials of the drug reported suicidal behavior and depression while taking this drug. Many patients even stopped taking it because of depression. Inform your doctor about suicidal thoughts or depression prior to taking Otezla. If you develop mood swings while undergoing Otezla treatment, immediately inform your doctor about it. There might be other potential side effects of Otezla. You doctor might be able to tell you about any other possible Otezla side effects. Inform your doctor immediately if a side effect of the drug does not go away or keeps bothering you.